Here now is the representation of what has been previously disclosed in Qolasiym 1, and in our discussion of Qolasiym 2 so far. Now we see the Rosh over the top of the crucifix (the pendiculum stauros) [note, however, that the top of the threefold Rosh is Kether, which is the flipside of the Da’ath]. 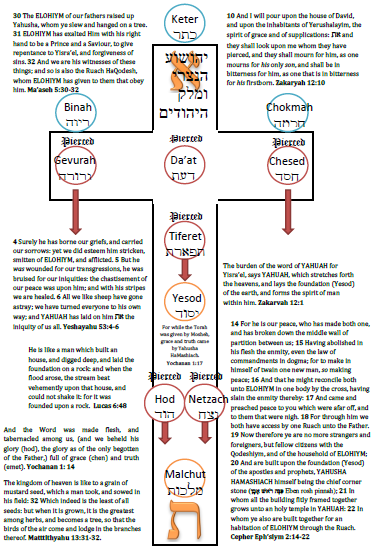 This image demonstrates that blood was shed by MASHIACH in each of these: the da’ath (knowledge) was crowned with thorns; the right hand of geveruah (strength) was pierced with a nail (vav); the left hand of chesed (mercy) was pierced with a nail (vav); the side of tiferah (beauty) was pierced with a spear; the right foot of hod (majesty) was pierced with a nail; and the left foot of netzach (long-suffering) was pierced with a nail. For the life of the flesh is in the blood: and I have given it to you upon the altar to make an atonement for your souls: for it is the blood that makes an atonement for the soul. Therefore, MASHIACH has atoned for 1) the sins of the mind (da’ath); 2) the sins of the right hand (gevurah); 3) the sins of the left hand (chesed); 4) the sins of the heart (tiferah); 5) the sins of the right foot (hod); and 6) the sins of the left foot (netzach). There is a seventh blood atonement, however, which is of course one of the most glorious recitations in scripture – the consolation of Israel. And when eight days were accomplished for the circumcising of the child, his name was called YAHUSHA, which was so named of the angel before he was conceived in the womb. 22 And when the days of her purification according to the Torah of Mosheh were accomplished, they brought him to Yerushalayim, to present him to YAHUAH; 23 (As it is written in the Torah of YAHUAH, Every male that opens the womb shall be called holy to YAHUAH;) 24 And to offer a sacrifice according to that which is said in the Torah of YAHUAH, A pair of turtledoves, or two young pigeons. 25 And, behold, there was a man in Yerushalayim, whose name was Shim`on; and the same man was just and devout, waiting for the consolation of Yisra’el: and the RUACH HAQODESH was upon him. 26 And it was revealed unto him by the RUACH HAQODESH, that he should not see death, before he had seen YAHUAH’s את eth-MASHIACH. 27 And he came by the RUACH into the Temple: and when the parents brought in the child YAHUSHA, to do for him after the custom of the Torah, 28 Then took he him up in his arms, and blessed YAH, and said, 29 YAHUAH, now let your servant depart in peace, according to your word: 30 For my eyes have seen your YAHUSHA, 31 Which you have prepared before the face of all people; 32 A light to lighten the other people, and the glory of your people Yisra’el. 33 And Yoceph and his mother marvelled at those things which were spoken of him. 34 And Shim`on blessed them, and said unto Miryam his mother, Behold, this child is set for the fall and rising again of many in Yisra’el; and for a sign which shall be spoken against; 35 (Yea, a sword shall pierce through your own soul also,) that the thoughts of many hearts may be revealed. 36 And there was one Channah, a prophetess, the daughter of Penu’el, of the tribe of Asher: she was of a great age, and had lived with a man seven years from her virginity; 37 And she was a widow of about fourscore and four years, which departed not from the Temple, but served את eth-YAHUAH with fastings and prayers night and day. 38 And she coming in that instant gave thanks likewise unto YAHUAH, and spoke of him to all them that looked for redemption in Yerushalayim. 39 And when they had performed all things according to the Torah of YAHUAH, they returned into Galiyl, to their own city Natsareth. There is so much in this passage; yet, let us focus on the topic at hand. On the eighth day following the birth of MASHIACH (which I have held took place on the first day of the fall feast of Sukkoth), which would therefore have been Simcha Torah (the joy of the Torah), in strict accord with the tenets of Torah, MASHIACH is presented in the Temple for circumcision. And so the blood atonement for the circumcision is had vicariously through MASHIACH for the redemption of the whole of the house of Yisra’el. And we note that he is attested to by two witnesses, Shimon attesting to him as MASHIACH, and Channah attesting to him as redemption. 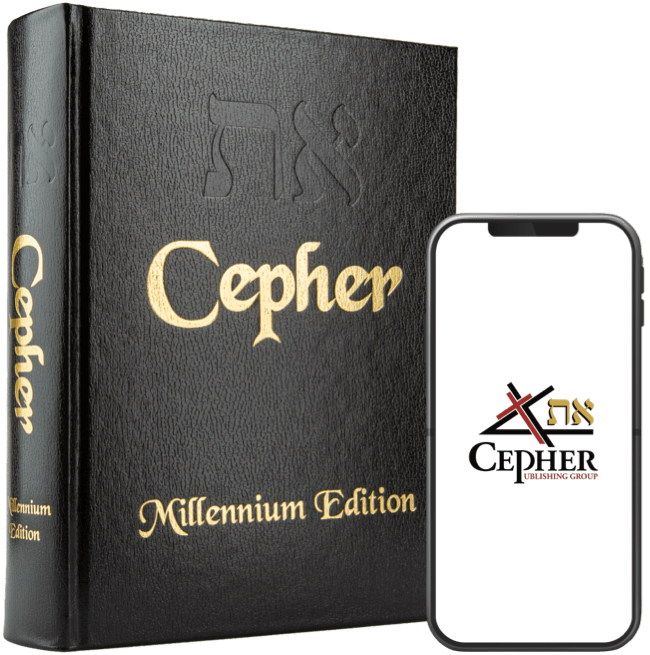 Note that where the atonement for the circumcision is given through the blood of MASHIACH, the immersion is still an act which must be performed as an open statement of faith. And the faith required here is that MASHIACH was raised from the dead – resurrected into an eternal Besor (new body), a living ELOHIYM – who was, who is, and who is to come.